Omeprazole is a proton pump inhibitor, a type of medicine that decreases the production of stomach acid. The stomach produces acid to digest food. An excess of stomach acid or damage to the lining of the stomach can cause symptoms such as reflux and stomach pain. Omeprazole reduces the production of stomach acid. This helps relieve or eliminate these symptoms. Omeprazole is a prescription-only medicine. Doctors usually prescribe an antacid to neutralise the acidity in the stomach. If this is not effective, acid inhibitors such as Omeprazole can be used. 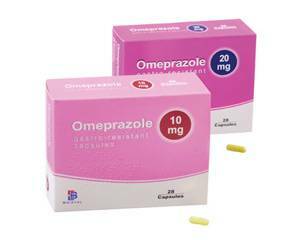 Omeprazole relieves stomach problems such as heartburn, acid reflux, bloating and stomach pain. These symptoms can be caused by peptic ulcers, oesophagitis (inflammation of the oesophagus) or Zollinger-Ellison syndrome (excessive secretion of stomach acid due to a tumour or enlargement of the pancreas). Omeprazole can also be used as a stomach coater to prevent stomach problems. Omeprazole capsules should be swallowed whole with plenty of liquid. If you have difficulty swallowing the capsules you can break them and disperse them in some water, yoghurt or fruit juice. The pellets in the mixture should not be chewed. Rinse the glass with half a glass of water and drink this to ensure that no medicine is left behind in the glass. Omeprazole should preferably be taken in the morning at the same time each day, and may be taken with or without food. If you are taking Omeprazole twice daily, try to take the capsules in the morning and at night. The number of capsules to take and for how long will depend on the condition being treated. It is important to follow the instructions given by your doctor. Adults: one 20-mg or 40-mg capsule, once a day. Children may need to be given an adjusted dose. Read the package leaflet before use. Most side effects are usually only temporary and will disappear once the body adjusts to the medicine. Consult a doctor if the side effects are persistent. For more information, see the package leaflet. You are taking the anti-HIV medicine nelvinafir. Consult your doctor on the use of Omeprazole if you have health problems. Be sure to inform the doctor of any medicines and nutritional supplements you are taking. Omeprazole may interact with certain medicines, so the doctor should check if the combination is safe. Omeprazole should not be used by pregnant or breastfeeding women without consulting a doctor first. Omeprazole may cause dizziness or sleepiness, especially during the first days of treatment. Stay out of traffic if you experience these side effects. Alcohol irritates the stomach. Avoid drinking alcohol if you have stomach problems.